It’s been a rollercoaster few months for Irishman Philip Lavery. In August of last year he began a trial with the Cofidis team, and got off to a good start with some solid results. The 23 year old amateur was sixteenth in the 1.1-ranked Châteauroux Classic de l’Indre and then went on to finish fifteenth on a stage of the Tour du Poitou Charentes. Lavery also put in solid rides in support of his team-mates and says he was told that he was likely to get a place on the team if it got a WorldTour licence, as was planned. Unfortunately that step up didn’t happen for the team and Lavery found himself without the pro contract he had worked hard to achieve. He might still have secured himself a slot, except for one particular problem: a number of pro teams had problems finding new sponsors and collapsed, including Euskaltel Euskadi, Vacansoleil DCM, Champion System and others. The smouldering wreckage of those squads saturated the market with riders. With few openings available, it was very difficult for them to secure deals. Left without a pro contract, Lavery faced the prospect of another year in the amateur ranks despite what had been good stagiaire performances. He was disillusioned with that situation and took the decision to make some sweeping changes. He sold his bikes. He got a job. He gave up on his long-running goal of turning pro. For all intents and purposes, it looked like game over for his sporting career. “I still have quite a good relationship with Cofidis, they kept in contact. It wasn’t really a bad ending,” he told VeloNation, although it’s easy to imagine his frustration at the time. “The plan had been that the team would try and go to the WorldTour as there wasn’t going to be a competition for places. But then some factors came up that hadn’t been seen and it didn’t work out in the end. Lavery is known for being a strong-minded, somewhat stubborn person. He said that when he decided to do something other than cycling, he didn’t waste time in that transition. “Once that happened with Cofidis, I didn’t really see the point in keeping my bikes,” he said, looking back. “People know how I am…I am very final about things. When I make a decision, I don’t change. Lavery took up a role with Smartlamp, a company dealing in energy-saving outdoor lighting. It is run by the Irish domestic rider and cycling fan Noel Thompson and he knuckled down to his new role. He did some running to keep himself in decent condition, but otherwise had turned the page. Months later, though, a curious twist occurred. It concerned the Synergy Baku team, an Azerbaijan-backed squad which is managed by David McQuaid and which also features three other Irishmen on the roster; national champion Matt Brammeier and Connor McConvey as riders, and David McCann as performance manager. The team was full but one of its riders, Will Walker, was forced to retire after a heart condition thought to be resolved flared up again in the Australian road nationals in January. The medical issue created an open space in the team and McQuaid had a clear idea of who he wanted to fill the role. “We had two teams racing two programmes and while at the beginning I thought we would be okay being a man down, David McCann, Jeremy Hunt and Julia Dobernig [the team’s logistics manager – ed.] in the office hinted that we were struggling with numbers in races. Because of that, the search for a rider was needed,” he said. McQuaid had been speaking to an Irishman Johnny Carroll, who knew Lavery and his situation. The 23 year old rider had also been in contact with McCann, who was trying to convince him to return to the sport and to ride the Commonwealth Games later this year. Both urged McQuaid to consider Lavery and, after speaking to him, McQuaid decided to give him a slot. 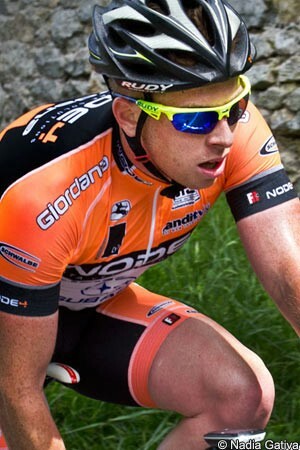 Lavery will consequently begin his season with the team on Sunday when he rides the GP Izola in Slovenia. “What has happened is quite nice,” said Lavery. “I’d given up on riding the bike this year. Maybe there was a chance I would have come back for the Commonwealth Games and then seen if I wanted to keep riding my bike after that, but I’d stopped for now. “I was doing 100 kilometres per week running, so that is going to stand to me. I was quite afraid of stopping the bike and turning into a fifteen stone guy sitting in a pub lamenting what could have been. Lavery has long stood out as one of Ireland’s most gifted young riders. 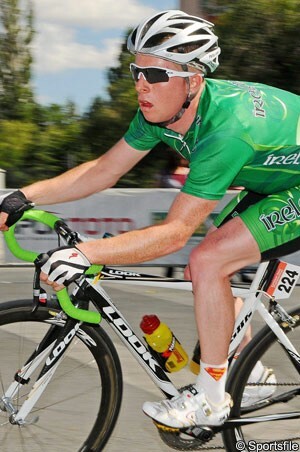 He raced with the An Post Sean Kelly team in 2011, then spent a year with the Node 4 Giordana squad in 2012, becoming Irish under 23 champion. He was also second in the 1.2 GP de Pont-à-Marcq/Ronde Pévèloise. In 2013 he returned to France and spent most of the season with the AC Bisontine. In addition to netting a number of wins in events there, including the Prix des Vallons Coupe de France event, he was also fifth and tenth on stages of the Tour de Beauce in Canada and finished runner-up to Matt Brammeier in the Irish road race championships. Those rides led on to his trial with Cofidis and, eventually, to the Synergy Baku deal. Following the latter agreement, McQuaid got a bike to Lavery and he has knuckled down to training. However while he will be riding internationally with the Synergy Baku team, he will also keep on his role with the Smart Lamp company for the time being. “Noel is really into his cycling. I have been very open and honest with him and he is happy for me to continue working but to tie it in with a racing programme,” he explained. Lavery knows that if things go well, there will come a point where he has to decide if he will continue working or commit to racing full time. Given his previous intensity and commitment, it’s hard to imagine him not knuckling down again, particularly if it becomes clear that a good pro career is possible. However he saw the tough side of the sport with the Cofidis situation and is wary about staking everything on the sport. “I saw some of the guys who were retiring last year. There was one guy who was packing it in after being a pro for eleven years,” he explained, talking about the factors that shaped his decision. “He had had done the Tour, he had good results. He was retiring from a good wage of over 140 grand a year, going back to university and trying to get work. “I think that opened my eyes up and because of that, when the Cofidis deal fell through, I didn’t go for other [smaller] offers I had but instead turned to work. While I realise that cycling is a great way of living and is a fantastic lifestyle, you have to think about the future a little bit more. The pragmatism is something that Walker himself articulated in a video interview with VeloNation conducted in December. He had been forced to take time away from the bike due to health issues, and while he planned to race, said that he had a more balanced view of the sport as a result of what he had been through. McQuaid sees another similarity between the two riders. “Ironically enough, Phil is in some ways the same rider as Will. He’s not a specialist, and he has a cheeky never-say-die attitude to racing. Will has the benefit of experience, but Phil can get us results. Because they are so identical into their punchy nature as bike riders, we've slotted Philip into Will's spot on the calendar, which at this stage is planned up until Tour d'Azerbaijan in early May. McQuaid acknowledges Lavery’s stubborn nature but says that once it is properly managed, it will be an asset. “A lot has been said in the seasons gone by about Philip's temperament, and I don't ignore it. In fact I've seen it,” he said. “But that doesn't deter me from the rider. In fact in away it attracts me to the rider. “Twelve months ago McCann and I had Philip on a list, yet in the end he didn't form part of the squad. Now here we are signing the rider. Things have changed. I now fully believe and trust in our team management and the environment that goes with it. 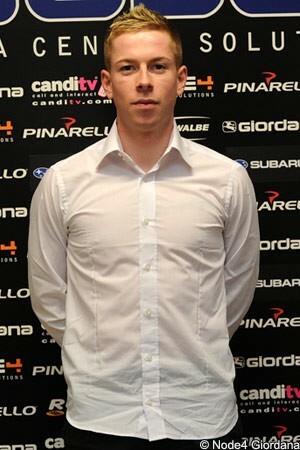 David McCann has fully switched to the role of performance director and he can be world class in that position. Lavery will begin in Slovenia and then compete next month in Croatia. He says the Tour of Normandy is a possibility before the An Post Rás in May. However he said that the French event will depend on how things go for him; if his form is behind where he expects it to be, he said that there is a chance he could pass over that race and take a different route to the Rás. As regards goals, he said that he is reluctant to make declarations at this point in time. “If I could see a return to the form that I had last year, or better, I don’t see why I wouldn’t be national champion this season. A medal in the Commonwealth Games would be a goal. But it is very early days…I haven’t really worried about results, as such. I have been more focussed on whether I will get dropped in the first few kilometres of a race! Lavery acknowledges that there are a number of strong riders on the team, including fellow Irishmen Brammeier and McConvey, as well as others such as Daniel Klemme. “He is really, really strong,” he said. As a result he accepts that his initial role may be a supporting one. “It is a very strong team and for the first couple of months I would actually be really happy to be part of a winning team [rather than chase personal targets – ed. ],” he said. “That is quite an honest answer. “I would rather do a job for a couple of months rather than just riding around at the back saying that I am looking for form, then being selfish when my time comes.